« Stay cool with sorbet. We had fun getting the chance to interview DJ – the produce specialist at our Burnside store. He had a lot to tell us as to why Zupan’s should be the first choice for every Oregon family. Zupan’s: What is your favorite part about working for Zupan’s? DJ: I love the integrity of the place. When I talk to people on the street, everyone seems to know the classiness and reputation of the store. They know it’s head and shoulders above the rest. It’s so great to work at the best grocery store in Portland! I enjoy the satisfaction in putting good foods out and having people so happy with it. Feels good to make people happy & people come back and thank you for your assistance all the time. Other grocery stores don’t show off their products like we do. Our excitement over good food rubs off on other people & they come back for more. For this reason, I don’t think I could work for anyone else. Zupan’s: How long have you been working in Produce? 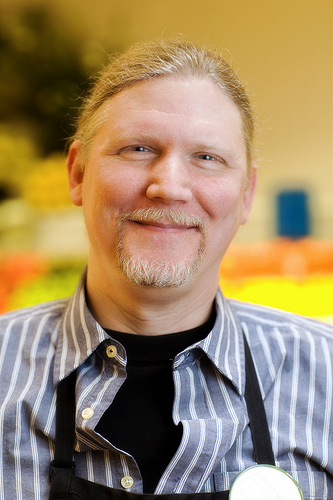 DJ: I’ve technically only been in produce for 5 years but I’ve been working for Zupan’s for over 20 something years. I’ve been in almost every work position in the store from grocery bagger to grocery manager. I REALLY love produce, though. It’s so immediate. So fresh and every hour counts! We have the best looking produce and displays. People get to try samples of our good food. In fact, the store is a bit overwhelming for newcomers. They end up buying a lot in the first visit because they see our delicious produce and just want to buy it all. I tell everyone to get a cart no matter what, because you end up buying more than you come in for. People will start to grab one thing, then end up grabbing so many more that they end up having to get a cart anyway! Zupan’s: What makes Zupan’s different than other grocery stores? DJ: In produce, people go for pretty and it’s hard because they don’t understand that fruit may not look pretty but still taste fantastic. Zupan’s gives the freedom for me to give them samples of the non-pretty fruit and veggies that come in to show customers that the fruits that may have surface defects are actually quite delicious. We also only put out high quality produce and if it isn’t, we don’t try to put it out there and sell it to customers. If a commodity is bad or not in season, we don’t get it because we only want the best for our customers and we aren’t going to sell people something that isn’t good.